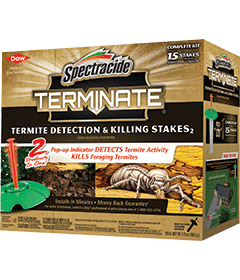 Spectracide Terminate Termite Detection & Killing Stakes2 are do-it-yourself termite bait stakes available to consumers. The stakes have a pop-up and an easy-to-find locator shields that make it easier for regular inspection. The kit also includes a digging tool, for faster installation, and complete instruction booklet. Spectracide Terminate products are not recommended as sole protection against termites, and for active infestations, get a professional inspection.